You are looking at a listing for a Boutique style Custom size A-line mermaid jumper dress. 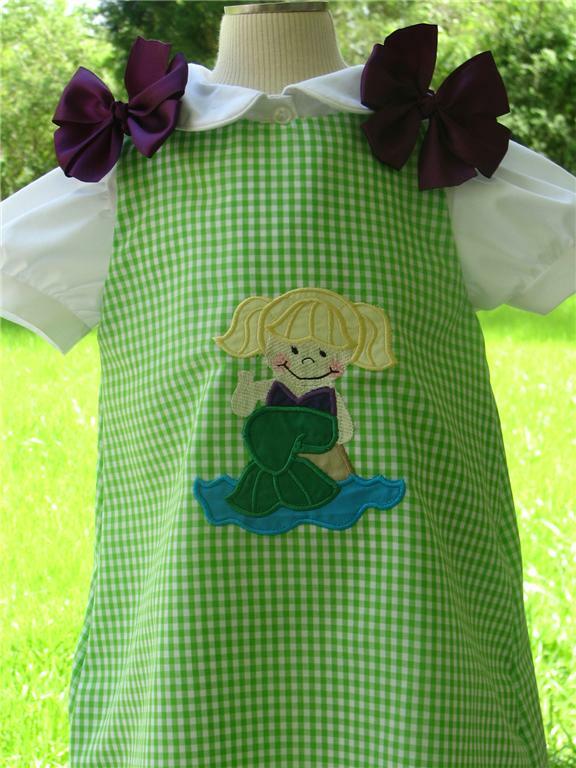 Just imagine how precious your little one will be in this cute dress walking down the beach! Outift is lime green ginaham, however I have many fabrics in stock and can recreate this to your specifications. The applique is satin stitched around the edges. Applique will be stitched directly onto the dress. This is NOT an iron on patch or a heat transfer! Your little one is sure to get many compliments on this one! Outfit comes from a smoke free, pet free home. A-line seams are searged, reinforced with a straight stitch with a 1/2" seam allowance to ensure quality, durability and a more professional finished dress, and then pressed open. Dress is fully lined in white fabric and buttons at the shoulders. The lining seams are serged, reinforced with 1/2" seam allowance and pressed open as well. The top and the lining are then hemmed seperate from one another to allow dress to be free flowing from the lining. Linging hem is approximately 1" shorter than the dress to prevent the lining from being seen when your little one is twirling about! Both hems are top stitched to add to the quality. Dress is adorned with removable coordinating bows to match. Bows are made from quality grosgrain ribbon and all edges are heat sealed. Bows are attached with safety pins. Add your choice of monogram for FREE. Choose from 1 letter, 3 letters, or a name. Sizes range from 3mo, 6mo, 9mo, 12mo, 2T, 3T, 4T, and 5T. If you need a bigger size please e mail me first so I can see if I can do it for you. Please specify the necessary information during checkout. Work will not begin until all information and payment has been recieved. If you need this sooner than 4 weeks please contact me first before purchasing to see I can do it for you sooner. It might cost you exrta money for a rush fee. Look through my store to purchase matching hair bows!